There are special gigs and there are really special gigs. 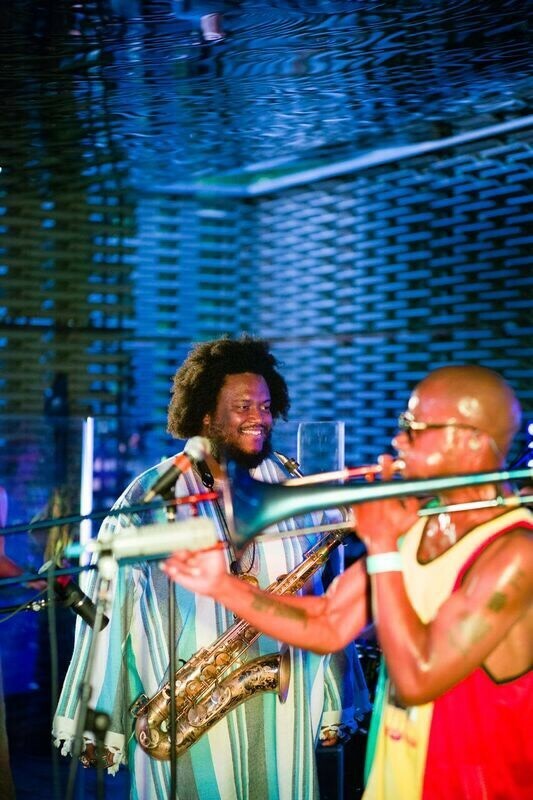 Kamasi Washington's concert in Frida Escobedo’s Serpentine Pavilion was extra special. The setting was unique – the indoors-outdoors space of Escobedo's intriguing, ethereal temporary structure beside the Serpentine Gallery. Fabricated with a lattice of cement roof tiles referencing the architect's Mexican heritage and, in its floor plan, the Greenwich Prime Meridian Line, it has an internal canopy clad with mirrored panels to expand the internal courtyard space, reflecting both its visitors and the play of the heavens. Ahead of the concert, early arrivers were greeted by the strains of Washington's band, The Next Step, going through their paces for their sound check. The perfect warm-up and introduction to the Pavilion's monumental, yet generously conceived, sculptural presence. Washington was elated to be playing such an intimate space – so intimate, he said, that he felt that he knew everyone in the room by their first name. He asked everybody to raise their hands and shout out their names, and responded, saying that there were a lot of Brians! This was a one-off: "…playing inside a piece of art… let's see what kind of magic happens." 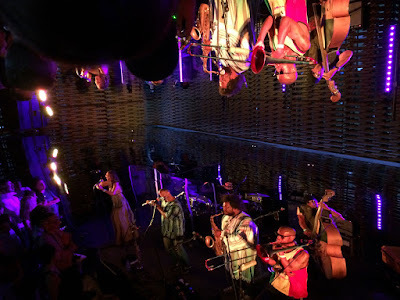 Washington, a musician and composer with jazz at the core, thinks in multi-media terms, and created an installation, Harmony of Difference, at New York's 2017 Whitney Biennial, combining his music with film and paintings, so the invitation from the Serpentine Gallery to participate in their experimental Park Nights platform was a natural step, perhaps given extra traction by his signing to the British label, Young Turks. He also played at the Proms in 2016, featuring his milestone project, The Epic (LINK). 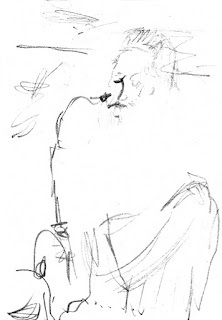 From a musical family, the young Washington's first jazz concert was seeing Pharaoh Sanders at a neighbourhood club in his hometown, an experience imprinted on his musical direction which gains full expression in his collaborative ventures, many with musicians who have been playing together since their high school days in Los Angeles. They read each other perfectly, having put in the time and energy to let the complex rhythms and interactions flow with seeming ease. Putting down the marker with a sonic sax and trombone blast, the band's two-pronged drum attack kicked in, Tony Austin behind a perspex drum screen to the left and Ronald Bruner Jr to the right. Already warmed-up, they flowed into the cosmic soul-jazz groove, with a serious helping of hard-line funk, as though they'd already been playing for an hour. Explains why they chose to have James Brown playing as the audience entered the Pavilion! And the sound quality in the Pavilion was right on the button. Washington's early solo had a soft edge to it with a brief sampled overlay, and later in the evening his debts to Coltrane shone through in measured, paced phrasing, erupting into passionate, explosive expression. He challenged the audience to work out the difficult time signatures in trombonist Ryan Porter's The Sound, where Porter added a punchy solo ahead of bassist, Miles Mosley, whose intricately wrought, light touch took a left-field turn in to a grittily distorted, Hendrixian zone. Patrice Quinn came to the fore in The Rhythm Changes, from The Epic, with dulcet, soulful vocals, growing in stature to unnervingly give the sense of a full choir from but a single voice. Her graceful, balletic gestures added a further dimension. Washington's father, Rickey Washington – "Pops! 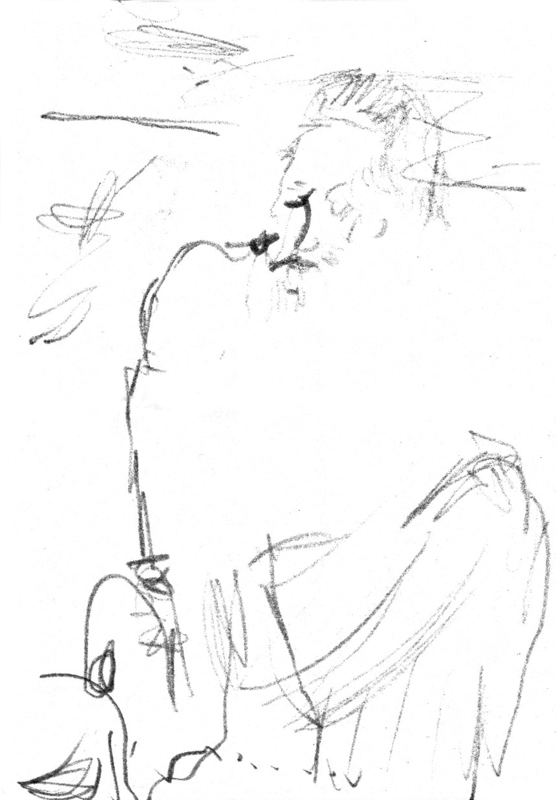 ", as he introduced him – joined the band, to contribute lyrical soprano sax and flute flourishes to the dynamic momentum. With both wearing striped dashikis, his delicate features and close cropped hair made a touching complement to his son's powerful stage presence. Washington makes a stand for musical sophistication. In conversation with the Serpentine's Artistic Director, Hans Ulrich Obrist (LINK) he has said: "One of the major struggles within music is the idea that in order to be accessible they have to be very simple. I've always disagreed… I feel like most of the greatest and most popular records are pretty complicated. The Beatles, Stevie Wonder, Miles Davis, James Brown; they all made very complicated music." From Harmony of Difference, Truth was described by Washington as one of five overlapping melodies in the broader context of his project embracing and celebrating diversity in the current climate of uncertainty. Mosely explored harmonics and electronic crunches before the band set down a cracking pace with Washington galloping into the fast lane to hang on to a single note which he pushed to the limit. The band's irrepressible, ultra-funk backbone was further buttressed by the virtuosic fluidity of Ruslan Sirota on keyboards, mixing the spirits of blues, jazz and soul with a sense of pure joy. A recent recruit to the band's roster, his invention and adaptability was something of a revelation! The first of two from the recent Heaven and Earth set, Space Travellers Lullaby, "for the dreamers and space cadets", had the soloing Porter bathed in perspiration before all dropped back to a perfectly synchronised wash to foreground Washington's intense interplay with the percussionists. Fists of Fury opened with a spell of retro wah wah, moving on to tight-as-toast section work with jagged, chunky keyboard chords tossed in to the mix and Quinn singing out the set with passionate commitment after a round of glorious solos. It had been a most precious evening with the musicians giving their all. To witness this at close quarters in such a special setting was a rare privilege. A jewel of a gig. Thank you for the little details which I missed, I agree it was an incredibly moving performance!